Problem #1 – The Defenders is a non-team (or so they say). It’s continually pushed, both in the book itself and in Marvel’s communications with the fans, that The Defenders is Marvel’s non-team of heroes. Seriously. That was their selling point. Problem #2 – The original team consists of Sub-Mariner, Hulk, Silver Surfer and Doctor Strange. That’s four nigh-omnipotent characters that have next to nothing in common. I guess that was supposed to be the charm…either that or they had to use the characters somehow before their trademarks ran out. Of course, The Defenders changed members more often than Spinal Tap changed drummers. I’m surprised any of them even knew each other’s names. The title quickly became Marvel’s circular file for unused characters. Problem #3 – Many of the team’s adventures had to do with villains named Yandroth, Xemnu, Nebulon, Mandrill, Overmind and The Headmen. Wow. Those names just invoke terror, don’t they? I am an insufferable fan of hokey villains, but only in the right context. A truck driver dressed in coveralls, rubber gloves and an electrified pig’s hide is the perfect foil for a laid-back and sarcastic Spider-Man. But when you have four of the universe’s most powerful heroes going up against a giant dust bunny , therewith a unibrow’s a clear disconnect. Problem #4 – Closely associated with the bad villains is the fact that most of the adventures The Defenders embarked upon were either overly concerned with bizarre dimensions or so steeped in cosmic mumbo-jumbo that they were almost nonsensical. What the hell are the science-minded Beast and the Prince of Atlantis doing in a Dali-esque dimension straight out of Alice in Wonderland? And, seriously, the Dragon of the Moon? If I can’t even explain it to my wife, then I don’t blame anyone for not reading it. So, to sum up the problems: The Defenders couldn’t pin down a membership (and when they did, the chemistry wasn’t there), they fought obscure foes in weird situations and no one took them seriously as a team. How the heck do you fix all of that? I’m not sure if you do fix it. I think that the strength of the Defenders is in their innate ability to fight obscure foes in weird situations. Let’s be honest; if you have a super-hero team, you really should have a reason for them to exist. They need some sort of hook to justify their existence. The X-Men are for the mutants, the Fantastic Four are explorers, the Avengers are the premiere super-team….and the Defenders, I think, are more of a mystical group, fighting those foes that no other hero even know exists. I think the Defenders worked best when they were associated with Dr. Strange, whether or not he was a regular member. Strange was able to pinpoint and identify mystical threats, or at least more obscure threats, that other super-teams didn’t really know (or, to be honest, probably care) about, but truly were dangerous to the world. In fact, I think the Defenders even became somewhat known for this. I remember, when the Defenders were fighting a group of demons called The Six Fingered Hand, that they got a call from the Avengers. Captain America basically called them to say, “Hey Strange! We found some really weird *^@#, so we think you should take care of it!” Everyone knew that the Defenders operated on the outskirts of the Marvel Universe. With that being said, if you move in that direction, you also find that the Defenders fulfill a need that is currently not being filled in the Marvel Universe, and that’s dealing with things in a more supernatural or mystical bent. With Strange being the only really well known magical hero in the Marvel Universe, and with Strange no longer having a monthly comic, I think there is a true dearth of stories that touch on the occult. And yes, Strange is currently in the New Avengers, but when he’s with them, he’s just a superhero with magical powers. There’s no sense of a magical realm like you used to see in his own series. 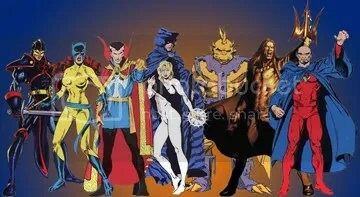 So, I think that the first step would be to assemble a group of Defenders that gathers together some of their more mystically aligned members (and there have been plenty of them) and then sending them off to defend the supernatural edges of the Marvel Universe that tend to be ignored by the mainstream heroes. I think you hit the nail on the head in that last sentence: The Defenders need to defend something. They need to defend the Earth from weirdness. They need to defend reality itself. And I agree that that mission begins and ends with Doctor Strange. He was the character that drew me to the Defenders to begin with (to be honest, I’ve never liked the Hulk or the Silver Surfer and I’ve only recently begun to appreciate the potential of Namor). I guess one of the inherent problems with the original run of the Defenders was just a product of the times. You mention the occult and it has to be acknowledged that a certain interest in occult themes peaked in the 1970’s. I remember a lot of Bronze Age books from Marvel touched on those same ideas…Tomb of Dracula, Ghost Rider, Man-Thing, Marvel Spotlight (with Son of Satan) and, to an extent, Conan the Barbarian…not to mention Heavy Metal magazine and DC’s Swamp Thing, House of Mystery and House of Secrets. It was like leftover sixties hippie residue, black light posters and psychedelic music all coming together to freak people out. Once those energies dissipated, interest in the Defenders waned. You can see it in the fact that Beast joined up and immediately worked to legally justify the team’s existence. Up until that point, it was just an informal association of heroes who happened to have the same interests and experiences. And I think that’s what it should get back to as well. I want to see a “team” of occultists, mystics and magic-based characters working together to investigate the edges of the Marvel universe. But I don’t want it to be an extension of SHIELD or the government, it should be a group that is completely unknown and invisible to the world. Think less X-Files and more Buffy. They have their own networking abilities built on trust and ancient history. They go where they need to go and do what they need to do. No rules. No distractions. My other problem with the original Defenders lineup, as I mentioned above, was the inordinate amount of raw power it contained. Sure, they could punch the hell out of foes, but does that really help on the magic side of things? I think any plausible Defenders lineup should have a focus more on detective abilities and a knowledge of the obscure, a certain attunement to that realm and its surroundings. 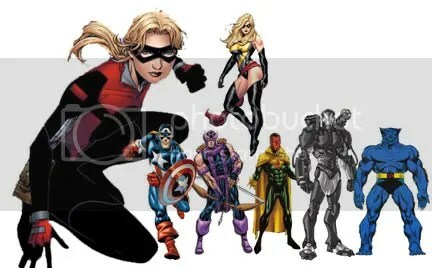 So who fits the bill in the Marvel Universe? Well, let’s look at past Defenders to begin with. Obviously, Dr. Strange would be the catalyst for forming the group. Like you said, he is Marvel’s foremost authority on magic and the most easily recognized manifestation of it. One of my favorite characters, who I don’t believe has been used properly lately, is Daimon Hellstrom. When you think of occult, you can’t get much more appropriate than a Lord of Hell who has tried to rebel against his lineage. He and his wife (Ex-wife? Estranged wife?) Patsy Walker once ran an investigation business themselves. Gargoyle had been living with the couple for years after the New Defenders disbanded…you can’t look at that character without thinking of Gothic horror stories. And, for a character steeped in both a mythic past and his own scientific education, Black Knight would be a curious addition to the team. He was a Defenders member briefly and brings a legitimacy with his Avengers past. Outside of previous members, I’ve always been interested in Cloak and Dagger. They’re young, they live on the edge of society and yet have a certain connection to religion, purity and salvation. Both have worked with Strange in the past and recently post-Civil War. I think they’d add youth and a different outlook to the team. How’s that for a new Defenders lineup? The wonderful thing about using Dr. Strange is that he’s a really busy man. He can pull the team together (as he did many times during the run of the original series), set them on their path, and then he can fade out if you don’t want to use him (“Sorry, have to go check out a revolution behind The Purple Veil in the Dimension of Watoomb!”) or you can keep him front and center during the story. He works either way. I think saying that Daimon Helstrom and Patsy Walker haven’t been used well lately is something of an understatement. I don’t want to knock the creators who have been using them since they left the Defenders, but their personalities seemed to change drastically, and for no good reason. I’m all for character development, and if natural forces change people to a point where they would no longer logically be together, I’m fine with that. But when characters just suddenly start acting like completely different people with no explanation as to why, I get concerned. That seemed to happen to both of these characters and I’m horribly confused as to their status, since it almost seems like writers have been throwing ideas about these two out to the reading audience pell mell, hoping something would stick. Heck, even the Marvel Universe official site doesn’t seem to know what’s up with these two crazy kids, as in some places on the site they’re considered separated and sometimes they’re considered divorced. What the heck? I would love to see them used again. I don’t even have a problem with them being separated, or divorced. Look how much more interesting Hank and Jan Pym often were when they worked together after their divorce. And Jan was upset that Hank hit her….Patsy has that beat hands down, since her husband drove her to an insanity fueled suicide! I’m pretty sure that Patsy gets to be guest of honor at the next “My Super Powered Husband is a Big Fat Jerk” convention. I think the tension between the two of them could be very interesting. I love Dane Whitman, and he really fits in well here. Except for Dr. Doom, I can’t think of another character who straddles the science/magic line so well. Dane is a scientist who wields a magic sword. He’s a modern man who spent years fighting in the crusades. He’s spent years of his life as a stone statue, fighting in the land of Avalon with the druid Amergin, and as a living weapon when his entire body started to become razor sharp, after invoking the curse of the Ebony Blade. There’s a great history here, but he hasn’t really had much of a showcase since he left the Avengers right before The Crossing started (and kudos to Dane for knowing the best time to get the heck out of that group). I think Cloak and Dagger are a great duo, and don’t have much more to add to what you said about them. As for the Gargoyle…<sigh>. He does have an interesting visual. Sadly, his visual is about all that’s interesting about him. At the same time, there is potential here. I think the way to use him would be to play up the fact that he doesn’t seem to have much of a purpose. I always saw him hanging out with Patsy simply because he didn’t know what else to do. He’s really an old man, and it must seem to him that the world has passed him by. I think he’s got some potential, but for me, he’d be the most work. At the same time, once you started bouncing him off the other people in the group, he could become one of the most interesting people in the book. Who has not felt, at some time, as if they are adrift, without a specific goal, purpose or mission in life? Gargoyle would be easy for people to relate to. And don’t forget Dr. Druid. I love Dr. Druid! I’m one of the select few comics readers who seem to like this character (I meet with the other three once a month), and boy, has he been misused over the years. He has a great history with Dane; they were close while Avengers, until Druid tried to take over Dane’s mind and use him for evil. I wonder if Dane has gotten over that yet? Sadly, Druid has a mild case of being dead that he’d have to recover from before he could be used. On the plus side, there’s obviously a medication in the Marvel Universe that cures that particular problem, so it shouldn’t be a huge problem. What I really like about this group is that there isn’t a lot of raw power. Don’t get me wrong; none of these are really lightweights. But what they have in spades is knowledge (maybe not Cloak and Dagger so much, but the others). Hellstrom, Hellcat, Strange, Dane and Gargoyle (and Druid) are all experts in different areas of mysticism, the occult, and supernatural matters. Which is odd considering her costume is the lamest of the group. Zing! Dr. Strange is meditating in his Sanctum Sanctorum when an odd noise disrupts him. The sound is coming from his library. When he enters the library, he sees an ancient artifact disappear in front of his eyes. He calls to Wong to ask if they’ve had a visitor, but both Wong and Strange’s own defenses reveal that no one has entered the building. Strange isn’t overly alarmed, but he is curious. He contacts Cloak and Dagger, because of their street connections, to ask them about the disturbance/possible theft. They assure him that they haven’t heard anything, but then Dagger reveals that she feels a strengthening evil. Strange asks Cloak to transport them to Massachusetts. The trio arrives at the home of Daimon Hellstrom. He and Strange confer and Hellstrom agrees to help them in their search. The four of them arrive back at Strange’s abode where Wong informs them that two other artifacts have gone missing. Strange takes inventory and determines that the three missing items could be combined into a very powerful weapon. Strange finds Hellstrom in his library flipping through the pages of the Darkhold. As Strange is telling the group about the potential weapon, the Darkhold disappears right in front of them. Immediately, there is a knock on the door. Wong opens the door to find The Dwarf (of the Darkhold). The Dwarf informs them that 12 pages of the Darkhold have been used. He then hands Wong a vellum envelope and vanishes. The envelope holds a piece of parchment with an arcane riddle on it. Strange decides they need more assistance to tackle this problem, but before they can decide on who to contact, something comes crashing through the window…a giant mutated crab’s claw. The heroes rush outside to confront hideous versions of Cancer, Scorpio, Leo and Taurus from the Zodiac. After a brief battle, the heroes defeat these monsters. Daimon tells Strange he will return shortly. Then Strange uses his astral form to contact Dane Whitman (Black Knight). He tells Whitman about the possible supernatural weapon and enlists his help. Meanwhile, Hellstrom has traveled to find his ex-wife Patsy Walker and their friend Gargoyle. His appearance startles Patsy, but she tells him that her current position with The Initiative is not very fulfilling and, with the agreement of Gargoyle, the two of them go AWOL from The Initiative to join The Defenders. The group returns to Strange’s home where they decode the riddle and determine that the force they are facing is none other than…Doctor Druid! Returning to the site of Druid’s death, they discover a black hole tearing through reality. Here, they face off with the rest of The Zodiac, possessed by the Darkhold pages. The team works well together in defeating their enemies. Druid emerges from the nothingness and promptly collapses in front of them. As it turns out, Druid’s spirit had been inhabiting a plane that ran concurrent to reality. This allowed him to move easily between the centuries, essentially plucking the artifacts from the timestream before Dr. Strange ever had them in his possession. With the staff assembled and the Darkhold to power it, Druid was able to bring himself back from the dead. Unfortunately, the Zodiac were on the same plane with him and took advantage of his power to resurrect themselves as well. Druid wasn’t purposely doing all of this to be evil, but he had no other way to come back. The group accepts this explanation and welcomes Druid to their fold. Unfortunately, by invoking the Darkhold and by using the weapon he created, Druid has started a ripple effect that threatens to allow the supernatural to take over reality. The Defenders now have a mission…to investigate these potential uprisings and defend the Earth from their powers. I agree that this group as a lot of potential, and I think that the group could be very interesting. To me, team books succeed or fail on the strength of the personalities involved and how they interact. As we’ve discussed in previous posts, these characters have diverse backgrounds, and together, they have connecttions all over the Marvel Universe, from the street level contacts of Cloak and Dagger to the cosmic connections of Strange. There are also a lot of interesting character arcs that you could work through as you throw mystical menaces at them. I really like the idea of having Gargoyle realize that his life since he became a super-hero has been somewhat bereft of any direction, at least one he set for himself. He’s followed the Defenders, and then the Hellstroms, and then Patsy alone, but he’s never done much on his own, and seems to be something of a blank slate when I’ve read anything with him in the past. I think that he’d want to start to find his own way in the world. He’s an older man (he should be at least in his 80s by now, although with the sliding Marvel timescale, that may not be accurate) when he’s not a gargoyle, and that has to color his actions. How do Patsy and Daimon feel about him hanging around them a lot? Do they like him, or is he kind of annoying to them, like Kramer from Seinfeld constantly hanging around? If the Gargoyle persona is functionally immortal (as in it doesn’t age), is his human form also immortal? Or, does anytime he spend as a human age that form? If so, time spent as a human would be quite precious for him and how would he want to spend it? Would he be attracted to the youth and vigor of Cloak and Dagger and want to spend time with them? Could they help him reconnect with who he used to be, and start making his own way? Or, would he find their youthful outlook confusing and unwelcome? There’s plenty of direction here. How do Patsy and Daimon deal with each other? Obviously, there have been some bumps in the road for these two. Daimon even went out of his way to lie to Patsy, believing that she would be happier without him. But, he still loves her. Does she love him? Will he work towards reclaiming her love, or will he continue his policy of pushing her away so that she doesn’t get hurt again? If the latter, how will he feel if she starts dating someone else (like, perhaps, Dane Whitman)? As I mentioned before, Druid and Dane have quite a history together. How will Dane feel about Druid’s actions when Druid took over the Avengers? For that matter, how does Druid feel about those actions? Will he be wracked by guilt, will he expect Dane to understand that Druid was being controlled at the time? Plus, Druid’s now created even more problems when he managed to resurrect himself. Can this man do anything right? Druid also has history with Strange, since he was technically the proto-Strange, and the two worked together quite a bit during some of the crazy Infinity crossovers of the 90s. I see this as being a dark, moody, supernatural book. Lots of dark colors, and probably as close to horror as one can go when you’re dealing with people in spandex. Please note that I’m not saying grim and gritty (well, maybe some gritty). I’d like to see some humor in the book as well. I’m not necessarily suggesting big laughs, but some of these characters are upbeat. Dagger has usually been portrayed as pretty optimistic, and Patsy is often portrayed as something of a joker (and I see Daimon having a sense of humor, albeit a very dry one). So, yes, moody, horror type stories, but with strong character development and leavened by a sense of humor. I think it could work quite well. Humor? Yeah, I think we’ve got that covered. The first running gag I can think of would involve Strange and Druid. We assume Strange will step back and become more of an absent leader for the group…like Charlie on Charlie’s Angels, right? Well, considering how often Druid has been possessed by everyone, wouldn’t it be funny to have Strange use Druid as his “speakerphone” every time he wanted to talk to the group? I agree with you about the feel of the book, to an extent. It should be closer to horror than superhero fare. I wouldn’t expect an crossovers with Spider-Man, Wolverine or The Punisher…more along the lines of Ghost Rider, Moon Knight and Man-Thing. However, while the environment is dark, I feel it would be clever to have the group be rather nonchalant about it all. Been there, done that. I think that’s where a lot of the humor could come in to it. These characters are in their comfort zone and almost feel nostalgic for what they’re doing. There’s definitely a lot of room for interaction too, as you’ve said. The fact that most of them are already familiar with each other is a plus, but it’s also interesting that they haven’t all worked together at the same time. I think a “love triangle” between Daimon, Patsy and Dane is a smart move…probably humanizes Daimon more than anything. I would see him as being pissed off at first like, “How dare she have feelings for a mere mortal over me!” But eventually he realizes how out of place he truly is and maybe gets some real emotion behind him. I’m guessing another woman would be brought into the group eventually…perhaps someone powerful like Gargoyle (he may venture off to “find himself”) then Daimon might show interest in her. Could be fun to have Patsy and Daimon trying to one-up each other with their new relationships only to realize they really love each other. I think the trust factor would come up with a lot of people. Dane doesn’t trust Druid. Patsy doesn’t trust Daimon (and I’m sure everyone else is a little wary of a Hell Lord). Maybe Gargoyle doesn’t trust Cloak and Dagger because they’re young. Druid probably doesn’t trust himself. Interesting to see how they’d handle all of this in team situations. To be honest, I’ve already taken notes for literally a dozen different storylines. And that’s not even counting your basic vampires, demons and killer plagues. I WANT THIS.